Guitar Noise Podcasts: Sound Check! Each Guitar Noise podcast is like a private, one-on-one lesson with David Hodge. These lessons are absolutely free and incredibly fun. 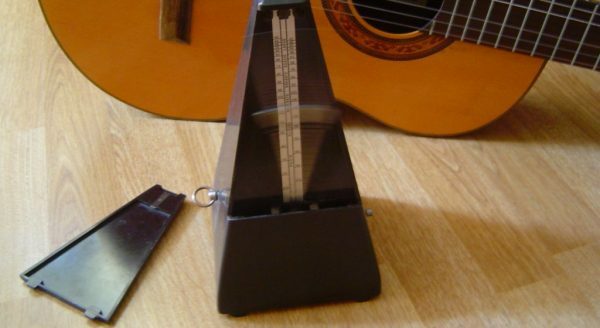 In this podcast we’ll look at the feel of swing and of how “swing eighths” differ from the “straight eighth” notes that we’ve been using in our strumming up to this point. For lack of a better way of putting it, we’ll be “stretching out” our downstrum – turning it from a typcial downstroke to something that’s more of a musical punctuation mark. This podcast will take us from the basic elements of string muting and then work on integrating this new technique into the strumming patterns and techniques we’ve covered thusÂ far. The tenth Guitar Noise Podcast gives us an introduction to palm muting, how it’s done and, more importantly, how it can become a vital part of your strumming bag of tricks. We’re going to take ideas from many of our past GN Podcasts and use them to create fills that will make our basic strumming sound even better. We’ll take one of our earliest strumming patterns and add a bit of crosspicking to it, giving us even more choices of variations and embellishments to the original strumming pattern. This time out we add the technique of crosspicking (using individual notes instead of strumming or partial chords) to give some variation and interest that basic strumming wouldn’t cover. In our sixth podcast we’re going to begin looking at 3/4 timing. Using a simple progression we will employ a “bass/strum” pattern and then add in a bit of a walking bass line to move things along.